THE Dublin winning machine keeps on rolling. By the time they play in this year's All-Ireland final against Tyrone or Monaghan on September 2nd, 1,463 days will have passed since their last Championship defeat. They are on the cusp of a fourth All-Ireland in a row, the mark last set by the team considered in the greatest in their sport's history. Today, they stealthily dismantled Galway – football's 2018 bright sparks – in Croke Park by 1-24 to 2-12. It was calculated rather than spectacular but it was strikingly authoritative and just now, it's difficult to see how Dublin can be beaten. Today, Jack McCaffrey was in scintillating form, both offensively and as an auxiliary defender. Brian Howard gave another demonstration as to why David Clifford may not even win this year's Young Footballer of the Year Award. And Dublin's inside men; Con O'Callaghan and Paul Mannion found some timely scoring form. Galway came to Croke Park with a dark cloud over an otherwise progressive season. True, they topped Division 1 unbeaten, lot a final narrowly to Dublin, regained the Connacht title, beat Kerry and qualified for a first All-Ireland semi-final for 17 years. But the meekness of their surrender in Salthill a week previously to a Monaghan side with a far greater cause had cast doubts. Dublin meanwhile, had motored smoothly into today's semi-final, the county's ninth in succession, although not without their own issues. Neither Con O'Callaghan nor Paul Mannion had scored since Dublin's Leinter campaign, although both put that that statistic to an end early here. After seven minutes, Dublin led by 0-3 to no score and appeared to be steadily building a lead but Damien Comer quashed that with a single flick of his fist. 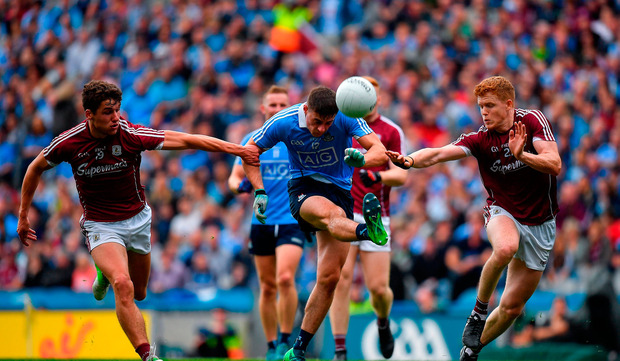 A long ball from Ciarán Duggan in the eighth minute towards the Galway captain sailed close enough to Stephen Cluxton for the Dublin ‘keeper to come from his line. It appeared as though Cluxton called to the two defenders who went up with Comer but Cluxton's timing was a fraction of a second out and Comer scored. Having taken the lead through Shane Walsh, Comer then won a penalty. Having cut inside two Dublin defenders, Comer went down under the challenge of Jonny Cooper and Galway had their chance to go four up. Cluxton made an excellent save from Eamonn Branningan, however, low to his left. From there, the teams traded scores until O'Callaghan broke his scoring duck with a palmed goal in the 27th minute. Jack McCaffrey looped a long, inch-perfect pass to Niall Scully, who squared for O'Callaghan to touch into the Galway net. The excellent Walsh and the stylish Ian Burke made sure there was just two points between the teams at the break. Thereafter, Dublin moved into a different gear entirely. McCaffrey covered an extraordinary amount of ground. Jim Gavin brought on Cormac Costello, who kicked three points. And Dublin completely nullified Comer. Shane Walsh scored a fortuitous goal to take the ugly look off the scoreboard but the Dubs had long since guaranteed their fourth consecutive All-Ireland final appearance.